I need to create a proportional symbol map for a GIS class. I am wondering, how can I manually change the symbology to make the dots grow in size depending on their magnitude represented, and also how can I manually change the color scheme? There is a very simple solution to this. 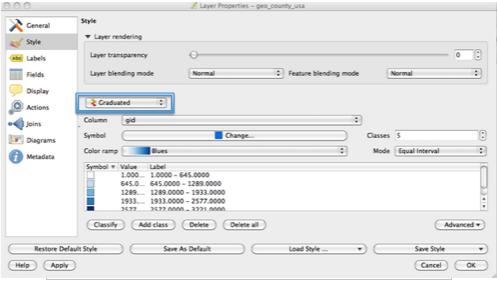 In QGIS, double click on the layer you are dealing with. Then go to the Style menu. In the Style menu, set your classification to “Graduated”. Then, double click on your symbol. This will take you to a menu where you have the option of changing your symbol layer type from “Simple fill” to “Centroid fill”. Once you have done that, see the symbol layers bar in on the left and click Marker. Click “circle” for your symbol type. Then change the size and color of your circle accordingly. Simply repeat for your other symbols. How to make two attributes display simultaneously on one shapefile? 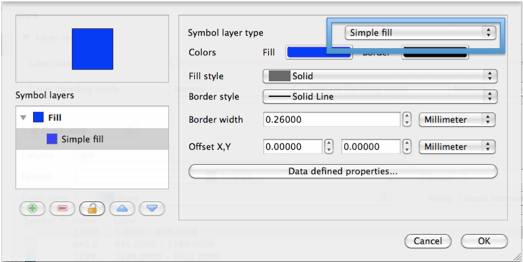 Removing border of symbol in QGIS? How to change the size of Hex bins?